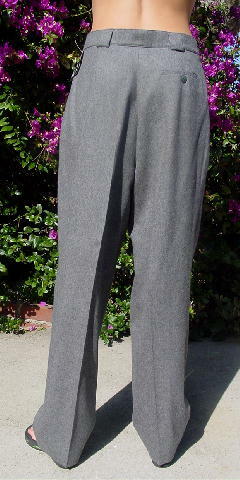 These never-worn (except for these pictures) 100% multi-tone gray wool pants have a dark gray 100% acetate lining. 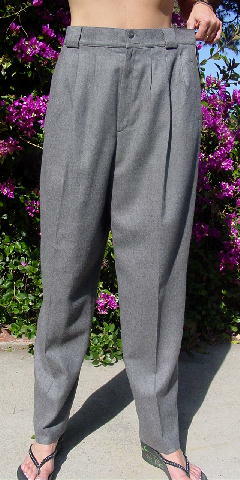 They have a 1 3/4" wide waistband with a 2 button gray button closure and belt loops. There is a 7 1/2" long zipper fly. They have a one button back pocket and the front has 3 wide short pleats. There are also 2 side vertical slit pockets. The tag is still attached. It says size 14, but they fit more like a 12-14.
waist to hem 44 1/4"